A “high five” punctuates that moment that is so undeniably radical that a simple thumbs up or fist pump won’t completely satiate the need to physically express joy and enthusiasm among others. It can be shared between sports teammates, office co-workers, young people, and old people and is regarded as the pinnacle of celebratory hand exchanges in any stadium or business seminar. 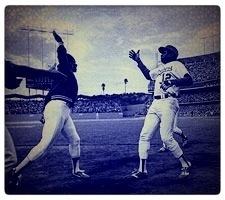 Makes you wonder how mankind got by before Glenn Burke and Dusty Baker spontaneously created the first documented high five moments after Baker’s homer helped the playoff bound Dodgers become the first team in history with four teammates who hit at least 30 home runs. The world is millions of years old, man is thousands of years old, baseball is over a century old, and still the first time people thought to slap hands in the air while cheering was in 1977 between an outwardly gay player and his other history making teammate? High-five indeed!